Experience exceptional traction - Traction ribs and multi-angled sipes achieve exceptional loose surface traction through gripping edges that interlock with the off-road surface. Open tread shoulder ensures efficient self-cleaning action for added traction in mud. Go off-road with confidence - Robust compound gives excellent cut and chip resistance. Reinforced tread blocks reduce block deformation. 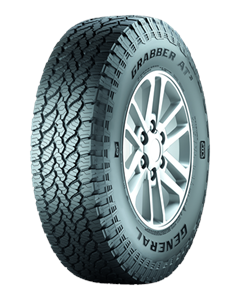 Both improve the tread life in rugged terrain conditions even in high-torque applications and deliver confident stability under all approved load conditions. Ultra high-strength steel belts ensure even footprint for confident stability. Enjoy maximum comfort - The uniform block geometry with low stiffness variation leads to an even material distribution and the optimized tread block orientation allows a smooth interaction with the surface and reduced belt excitation. This achieves a considerably comfortable and pleasant on-road drive in an all-terrain tyre line. · Sidewall lugs - Large sidewall lugs on the upper sidewall protect the tire body from stones, rocks and debris. · Deflection ribs- A series of stacked deflection ribs protect the upper sidewall area against penetration by deflecting obstacles away from the tyre body. · Rim protection rib - Rim Protection Rib shields the tyre and wheel bead area from damage caused by curbstones and off-road obstacles. · Experience improved stability through enhanced tread stiffness thanks to the large tread blocks and optimized siping. · Benefit from even wear through a wide, flat tread contour providing uniform pressure distribution and uniform abrasion. · Drive with confidence with thick sidewall lugs that protect the tyre body helping to prevent sidewall failures. Very efficient. Good staff and best price and availability on my Motorhome tyres. Well recommended. Excellent, very friendly, helpful and quick.